View More In Indoor String Lights - Page 4. Application: The Battery Operated String Lights are Widely Used in All Kinds of Occasions: Such as for the Decoration of Bedroom,Christmas,Party, Wedding, Festival, ,Kitchen, Restaurant, Hotel, Commercial Building, Shopping Center, Pub, Concert, Hall, etc. About Service:We hope every customer can have a good shopping in our store! 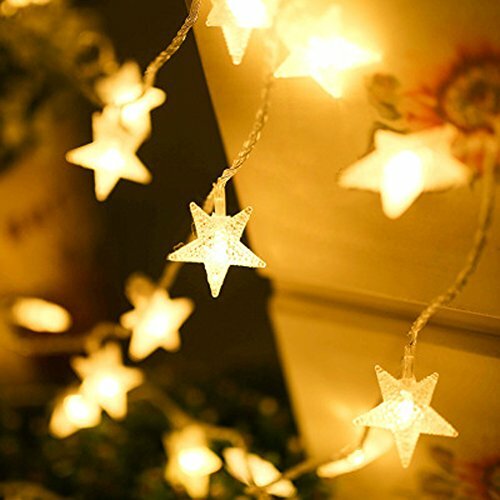 So if there is any problem with our star fairy lights, just feel free to contact us and we will help you solve your problem! The star battery string lights have two light modes for you to choose: steady on and flashing. It can be used for bedroom, wedding, party, Christmas, Thanksgiving Day, New Year and other decorations, creating a warm and romantic atmosphere. Easy installation and use, just install batteries into the battery box and then push the button, the star battery operated string lights will work, perfect for indoor and outdoor use. If you have any questions about this product by BJYHIYH, contact us by completing and submitting the form below. If you are looking for a specif part number, please include it with your message.